Daniela Ruah's Interfaith Marriage with Husband; How did the Couple first met? Daniela Ruah certainly knew what she was getting into when she shared wedding vows with her spouse in a mixed marriage. The couple is living blissfully ever since, even though she claims it's far from easy making the whole thing work. Interfaith marriages are often tricky and challenging since conflicts are likelier if the couple does not pay the right amount of attention to ensuring a successful married life. Luckily for Daniela, she appears informed on what it takes to enjoy a beautiful married life and so far you can't argue. 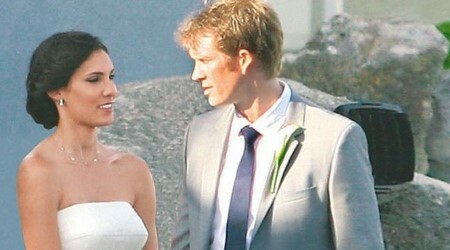 Daniela Ruah is married to her husband David Paul Olsen. The couple tied the knot on 17th June 2014. Daniela and David first met on the set of CBS series NCIS: Los Angeles. Daniela was one of the lead cast of the series who worked with Eric Olsen, David's older brother. David was the stunt double for his brother. You May Like; Hollywood Actress Chelsey Crisp's Married Relationship With Husband Rhett Reese; What About Their Children? "Eric kept inviting me to friends’ houses that he knew Dave would be at. Then he stepped back and let whatever develop between us, and the rest is history!" The pair apparently fell in love during their first few meetings. They dated for a few months before getting engaged in early 2013. Soon after, the actress was pregnant with her first baby. Six months prior to tying the knot, the lovebirds welcomed their first child named River Issac Ruah Olsen on 30th December 2013. Six months later, the wedding ceremony took place in Portugal in an interfaith marriage. The ceremony was attended by the couple's friends, families, and relatives. After two years of their married life, the duo decided to expand their beautiful family. They welcomed their second child, a daughter named Sierra Esther Ruah Olsen on 4th September 2016. It was later revealed the couple had gone through a tragic experience prior to giving birth to their second offspring. It was reported Daniela suffered a miscarriage in October 2015. Thankfully, the couple was blessed with happiness soon after. Meanwhile, David does not have an Instagram account of his account, but his fans certainly leave no shortage of effort to display their love and admiration for this adorable couple. In fact, the entire family of four looks absolutely adorable together. There have never been reports of any conflict between the pair, so it's safe to say their marital life is as blissful as ever. Ruah belongs to a Portuguese-Jewish ancestry on her father's side and Portuguese, Russian and Ukranian Jewish heritage on her mother's. The fact that David is a Lutheran has never been a problem according to Daniela and they are on the same page as far as their parenting is concerned. "Dave once said something to me that resonated very positively: ‘We never take away, we only add.’ So the way we’ve decided to do things is we want the baby to be comfortable with whoever he is with, whatever temple—in the broad sense—he decides to go to. We think it’s important that he knows both." "He had his bris and we plan on having his bar mitzvah and if there’s anything that David wants to instill in him we’re open to that too." Ruah further claimed one thing she learned from people in her own family who had married interfaith is they always told her it's very easy when it's just a couple, but not when they share a baby since both of them want to establish their own belief system and culture. Ruah went on to give advice to interfaith couples who are planning to start a family. She reckons, making sure everything is discussed before they share a baby is essential. Unless one of them goes, 'Do whatever you want, I’m OK with it' - there are bound to be complications. So it becomes crucial to discuss everything beforehand. Born on 2nd December 1983 in Boston, Massachusetts. Her parents are Moises Carlos Bentes Ruah and Catarina Katia Azancot Korn. Her mother is an otologist while her father is an ENT surgeon. Her family moved back to Portugal when she was 5. She went to St. Jullian's School. She began acting in telenovelas when she was 16. She won a Portuguese-television dance competition. She moved to England when she was 18. She went to London Metropolitan University and earned a Bachelor of Arts degree. She moved to New York City in 2007 and studied at Lee Strasberg Theatre and Film Institute. She is best known for playing special agent Kensi Blye in the TV series NCIS: Los Angeles. She has two different eye colors, brown and hazel. She played the role of Angela in the short film Safe Haven (2009). She made a guest appearance on Hawaii Five-O alongside Alex O'loughlin. Her net worth is estimated to be $7 million.